creating a space in the style of organic modernism. Hard lines from masculine Mid-Century pieces and Victorian steampunk accessories combine the client's interests, making for a refined, yet pleasing workplace. The client's own items - an ergonomic accent chair, library floor lamp, and wooden hook sculpture - are paired with an armless George Nelson studio sofa featuring original upholstery. Textured pillows and a vintage Turkish throw rug provide additional color and depth. A vintage Martz lamp sits atop a bookcase featuring photography from the client's own collection and found accessories, both new and old. The room's enormous picture windows offer plenty of natural light, perfect for the many plants on the wide wooden sills. Perhaps the room's best accessory is the surrounding New York City view. In order to avoid sitting all day, we opted for a custom sit-to-stand desk with a thick walnut top, allowing the client to adjust his work station as needed. 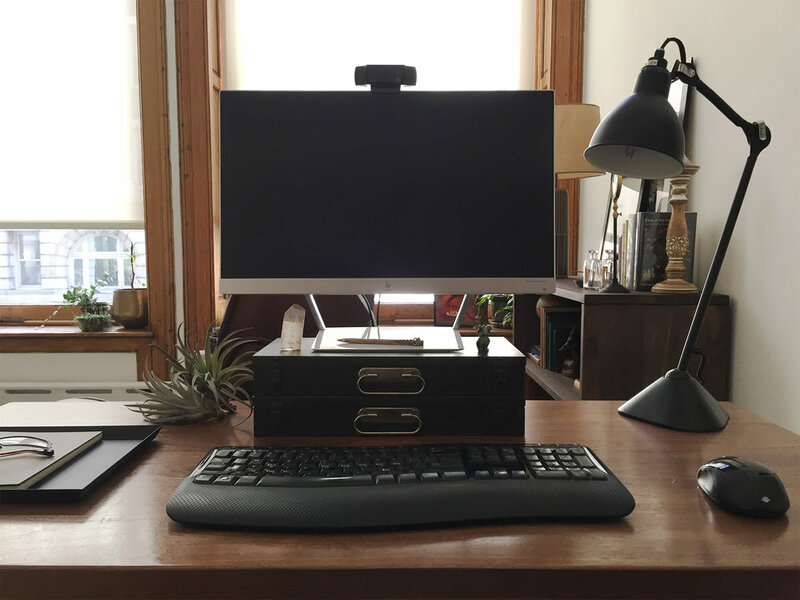 A couple of old slide boxes ensure the computer monitor is set at the preferred ergonomic height, and a task lamp provides additional lighting. The room's existing bookshelves are filled with art, objects, and classic works from the client's own collection.